Men & Women Welcome !! If you are interested in the cannabis industry and want to learn more, come out and join us April 3rd! 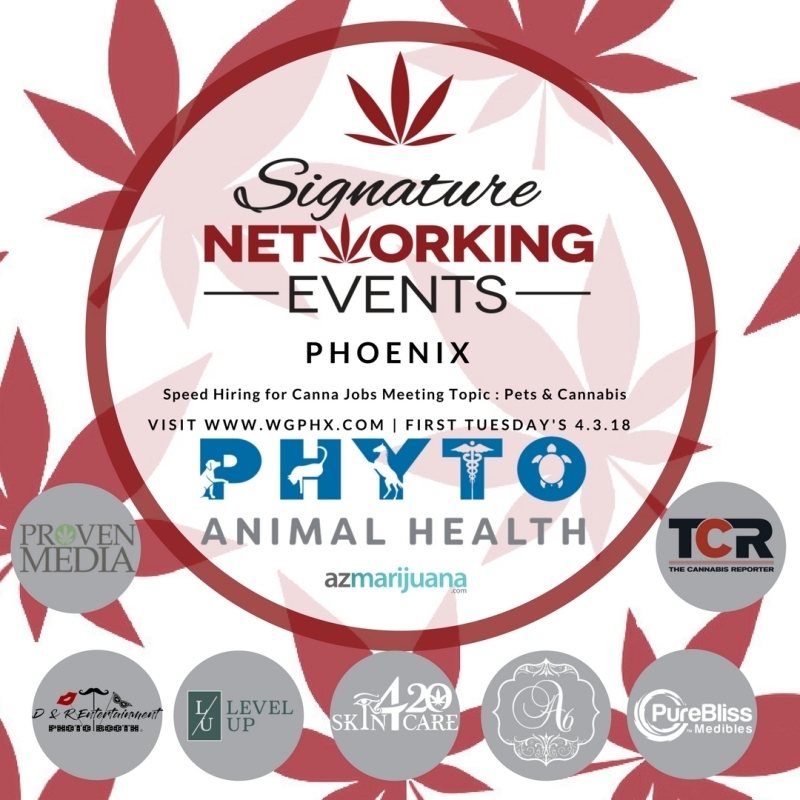 Meeting Topic: Pet’s & Cannabis, Learn how your pet can benefit from Cannabis with Special Guest Speaker Ian Quinn of Phyto Animal Health, Audrey Kerger of A6 Wellness, and Level -Up Scottsdale! Excited to announce PHYTO ANIMAL HEALTH, A6 Wellness, Level Up, Pure Bliss Medibles, 420Skincare & Mj Momma Consulting, Metro Meds and more will be at our next meeting! Includes a Women Grow $25 Complimentary Early Bird Ticket for May’s Signature Networking Event meeting topic “Canna Job Fair” and SURPRISE Women Grow Tshirt, redeemable coupons for Pure Bliss Medibles, 420Skincare, and CBD samples of Paw Puddy, Moon Picks and MORE to be announced!! Raffle Items include : 2 FREE MMJ Certification courtesy of Sun Valley Certification Clinics, 420Skincare CBD Gift Bag, Pure Bliss Gift Basket, Butch Bong Tool Gift Set and Tickets to Medicated Mavens… and MORE to be announced! MINI JOB FAIR FROM 4-6PM MUST ARRIVE AT 3:30pm for pre-registration paper work and sign in. MUST bring at least 10 hard copies of your resume, and DRESS to IMPRESS (business professional, no flip flops, t-shirts with jeans etc.) Prospects will NOT be allow you to participate unless you are meeting ALL criteria. Only Lawful Businesses under the AMMA may participate. Cost for Applicants: $10.00 Add-On to Women Grow Early Bird ticket. ALL attendees are required to register ONLINE for either an early bird ticket (with option of paying $10 in cash at time of the event) OR register for a Speed Hiring ticket. MUST have proof of registration, i.e. confirmation of online registration, either screen shot via mobile device or a print out of the email confirmation. Space is Limited for Employers and Employees, so Register EARLY! VOLUNTEERS : We have 15 Volunteers positions available for those willing to help with parking, clean up/set up, registration tables, social media, and swag bags. If interested please email our team at phoenix@womengrow.com for your special promo code. Note* Our long term volunteers receive a complimentary swag bags, as well as mentorships opportunities and special VIP invites to 420 community events throughout the year.